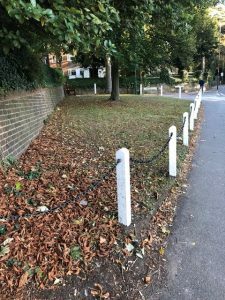 On 29 November we attended he first meeting for a long time of the Sutton South Ward Police Community Panel, held in the Parish Office at Christchurch in Christchurch Park. The summer meeting was cancelled at a late point due to it being on the evening of one of the football matches England were involved in in the World Cup. This was a meeting that left us feeling worried. An increase in crime, in burglaries and thefts from motor vehicles, was reported for the first time for some time. This may not be unrelated to problems of police numbers following the merger with Croydon and Bromley. There are a significant number of unfilled posts, vacancies, that the police are struggling to fill, particularly PCSOs (Police Community Support Officers). These officers are important for work on community relations. One member of staff is about to be moved to work in Croydon, though she did not request this move, and we are again losing our Dedicated Ward Officer, Kellie Heath. Kellie is also being moved to Croydon. Councillor Whitehead, the Chair of Sutton Council’s transport liaison committee, and Sutton Council officers will be meeting with TfL London Buses in the New Year to discuss how bus services can be tailored to meet future development proposals in the borough. It will also provide an opportunity to raise any issues related to any shortcomings with existing services. A similar meeting has been held in previous years but Councillor Whitehead tells us a more thorough review of outer London services is now promised by TfL. This is an opportunity to set out views on any changes we would like to see made to services in the area, including changes to frequencies or the duration of services, or route diversions/extensions to provide missing connections. Officers will consider how this information is presented to TfL. However, the final decision on any such changes rests with TfL and there will be limited resources available. 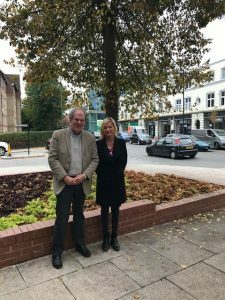 Local residents in Sutton South Ward have raised with us the following concerns when consulted in the recent past. Route frequency – although residents have commented that on some routes, such as route 80, frequency and reliability is good, bus 470 is seen as too infrequent, being only about every half hour. Similarly, route S4 could be more frequent. A further difficulty with the 470 is that it does not run on a Sunday so our suggestions for the 470 are to increase the frequency from once every half an hour, run it on Sundays and (see below) extend it to Epsom hospital. 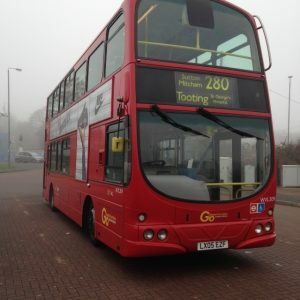 The X26 bus to Heathrow is used by many and the increased frequency of the X26 is welcome, but the buses have difficulty in keeping to the timetable, perhaps because of the length of the route. Some residents say they would not use it if travelling to Heathrow to catch a plane as it is not 100% reliable. There may thus be a case for increasing the frequency further. 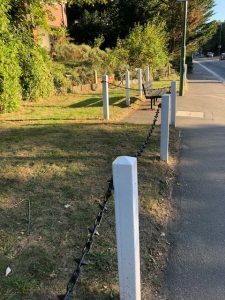 Route length – could the 470 go to Epsom hospital rather than Epsom market as there are residents who use it to go to the hospital? On route 151, the frequency and reliability is generally good but the service could be improved if some rush hour buses turned round at North Cheam, bearing in mind that the 213 duplicates the 151 onwards to Worcester Park. Timetabling – it is noted that the 80 and 280 buses running northwards along Brighton Road frequently arrive at the same time. Could the timetabling be looked at? 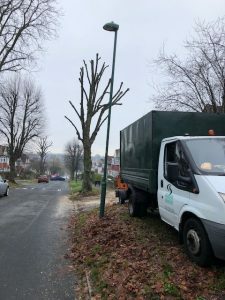 Passenger information – it has been pointed out that the two bus stops in Mulgrave Road close to Sutton station do not include digital displays on bus arrival information. Although there are other ways of getting this information, on your mobile phone, not all passengers have the skill to get this. A review of the information arrangements was suggested for some routes. On route 164, at some stops the bus is recorded as a minute away or due but it does not turn up for six or seven minutes. Other matters – There has often been comment on arrangements at Sutton station. 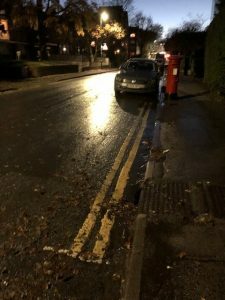 A resident suggested that congestion in Mulgrave Roadcould be alleviated by moving the taxi rank. It would be possible to move it to The Quadrant now the side entrance to the station is open, but this would probably be unpopular with the taxi drivers and railway passengers, and was not a proposal pursued under the Sutton Gateway project. 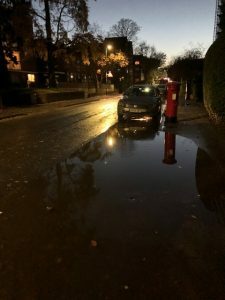 A resident also commented that this part of Mulgrave Road has on occasions been briefly flooded during very heavy downpours. 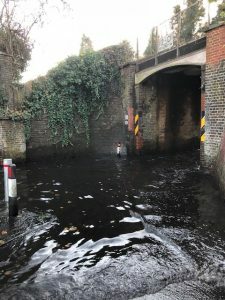 I have asked Council engineers to investigate. S4 – review the frequency. It should be noted that while this summary is focussed on suggesting improvements, many residents have commented to us in favourable terms on the frequency and reliability of local bus services. We have put this digest of views forward to officers for consideration. Any decision rests, of course, with Transport for London. Remembrance Sunday, November the 11th, was memorable. Trish attended the service at Belmont, Richard was called in at short notice to play the Last Post at the Remembrance Sunday event at the war memorial in Manor Park. The previous day he had played trumpet for the Phoenix Concert Band at a Remembrance event at St Barnabas church, locally. They played all the usual pieces such as Nimrod and Abide With Me. The day was also remarkable for the heavy rain. Richard spent the afternoon unblocking drains to eliminate the flooding in Grange Vale and Cedar Road. With winter fast approaching, we are anxious to help the NHS deliver the important messages that will keep our residents safe from influenza over this busy period. Last winter Sutton saw lower than the national average uptake in free flu vaccinations in 2 and 3 year olds. Small children are some of the worst affected by the virus and, if they get it, they’re likely to infect other members of the family too. We want to spread the message about the importance of people living in Sutton taking-up the flu vaccine. You can access Sutton’s winter toolkit by clicking on this link. Sutton’s winter toolkit contains information to help protect Sutton’s residents from flu including Local statistics on those most at risk from flu in the area, and Information on how you can receive your flu jab. The Liberal Democrats achieved a swing of 12% to the LibDems from the Tories in the by-election in Belmont Ward. 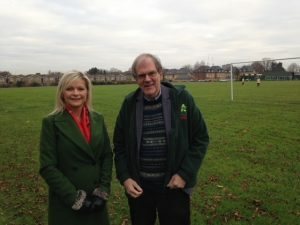 The by-election was caused by the resignation – still unexplained – of one of the Tory Councillors who had stood for election as recently as last May. 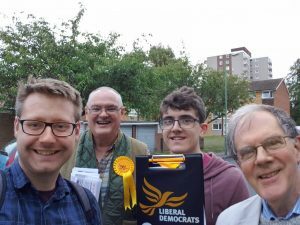 The Ward is the safest Tory seat in the borough so a shock LibDem victory was never on the cards, but LibDem Councillors take great satisfaction in the movement of opinion towards the LibDems. The first full Council meeting of the new administration, following the local elections, was held on 10 September. 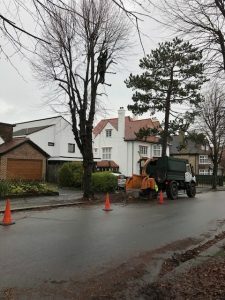 It was held at Overton Grange school, in Sutton South Ward, the first time the Council has met in our Ward, This follows a decision by Council to get out and about round the Borough, to see the Borough and be seen, rather than sit in the Council offices. 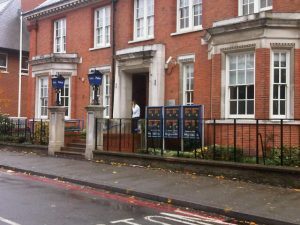 And a relatively high level of employment, contributed to by our success in persuading a major transnational company in the oil exploration business – Subsea 7 – to locate their global, international headquarters in the Ward, bringing 900 jobs, some – not just in more routine occupations – now being occupied by local people, with 900 staff spending money in local shops and restaurants, and boosting the local economy. 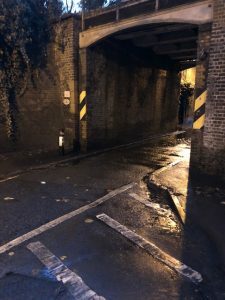 We remain concerned to reduce speeding in the Ward and the width restriction at Grange Vale was a measure to ensure vehicles slowed when passing under the bridge, to protect the safety of pedestrians walking on the narrow pavement, towards Brighton Road. 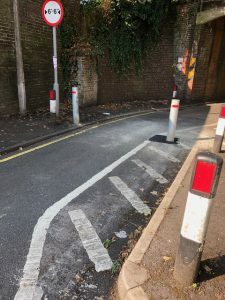 Residents suggested that as there is a slight right turn just as you pass through the restriction the standard width for such a restriction, of six feet six inches, was too narrow. 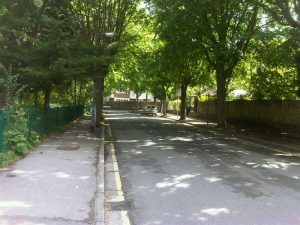 In response the width restriction has been widened very slightly. 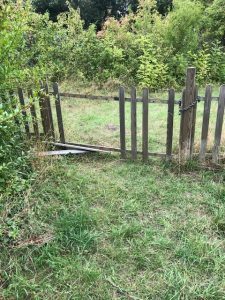 Richard is seeking action on the mindless vandalism that has plagued Warren Park recently, with damage to the fencing around the nature reserve area of the park. 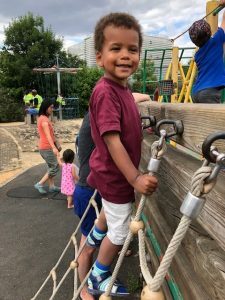 Though just outside our Ward, the park is used by many of our residents, particularly joggers, dog walkers and those caring for small children. Richard often takes his three year old grandson there. The mentality of people who would damage the fence in this way is disturbing. 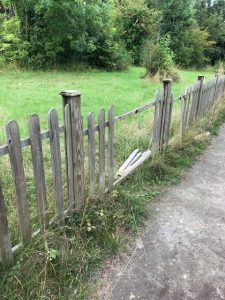 The park includes a walk alongside the two railway lines that run into Sutton station but a part is fenced off to protect wildlife and provide a nature area.